WAPA is pleased to announce that Mark Edberg has won the 2013 Praxis Award for his competition entry: Using the Concept of Social Well-Being to Develop and Implement a Framework for UNICEF Planning and Evaluating Efforts to Achieve Rights and Development Goals for Children, Youth and Families. 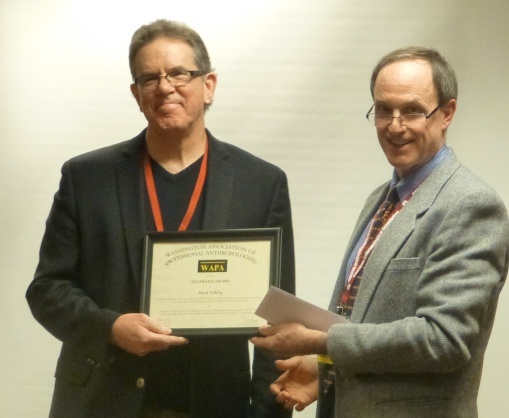 Photo: Mark Edberg received the 2013 Praxis Award and stipend from Praxis Chair Terry Redding. The application described Edberg's collaboration with UNICEF to develop and implement a holistic, multi-domain, social well-being model as a basis for planning and monitoring progress, where social well-being is understood as a precursor to the rights and development goals UNICEF promotes and monitors. The application described two aspects of Edberg's efforts: 1) the Adolescent Well-Being Framework developed for UNICEF Latin America-Caribbean, being tested in several sites and used in developing a UNICEF global survey module on adolescents; and 2) the Social Well-Being Framework used as the basis for a national situation analysis of women, children and youth in Belize, a five-year action plan, and for follow-up work to implement recommendations from the analysis. Edberg's work demonstrates a strong and successful application of qualitative methods typically used in anthropology in a setting usually dominated by quantitative methodologies, and shows a pragmatic approach to developing a comprehensive body of relevant indicators. His work was selected for the 2013 Praxis Award for demonstrating the value of using these anthropological methods in a large-scale, cross-disciplinary setting. In addition, these methods have been adopted by UNICEF for additional projects, making the potential impact and benefit of his work with UNICEF far-reaching. The applicant also successfully navigated several meetings with NGO and government officials to show the utility of the proposed framework, and worked through several steps with UNICEF to ensure project success. Dr. Edberg is with the George Washington University School of Public Health and Health Services (SPHHS), with secondary appointments in the Department of Anthropology and Elliott School of International Affairs. The competition in 2013 was exceptionally strong. Thus, there are three additional Honorable Mention winners for this award cycle. Photo: Rebecca L.H. 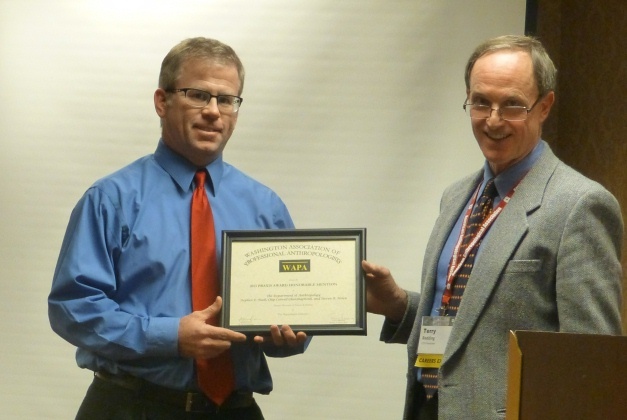 Berman receives the Praxis Award Honorable Mention from Praxis Committee Member Jim Stansbury. This team from CJE Seniorlife in Chicago conducted a culturally sensitive evaluation of Caring Together Living Better (CTLB), a partnership of seven African-American churches, two social service organizations, and one Area Agency on Aging targeting services to low income caregivers of older adults living in Cook County, IL. The evaluation focused on the development of a regional caregiver resource network and used qualitative research methods to document project processes, impact and meaning, including appreciative inquiry for strategic planning and ethnographic methods (observations, network analysis, story elicitation and open-ended interviewing) to capture project partners' views and perspectives. This application was selected for an Honorable Mention because of their successful use of a number of different qualitative methodologies, including participatory research and social network analysis to support engagement of churches in building local caregiver resources. The applicants described and demonstrated a sophisticated use of evaluation methods, while nonetheless keeping local stakeholders engaged and informed throughout the project. Importantly, the applicants detailed their planning and documentation process, which created a clear and sustainable model for others to follow, allowing for additional possible impact. The application demonstrates well the benefits of having anthropologists involved in community based initiatives. “The applicant shows sophisticated methods of evaluation and network interviews. I was particularly impressed by how they involved local folks at each step of the way, seeking to bring everyone to the same level of understanding. It was unusually clear in its step by step progression of activities described.” Drs. Iris and Berman are on the staff of CJE Seniorlife in Chicago, IL. 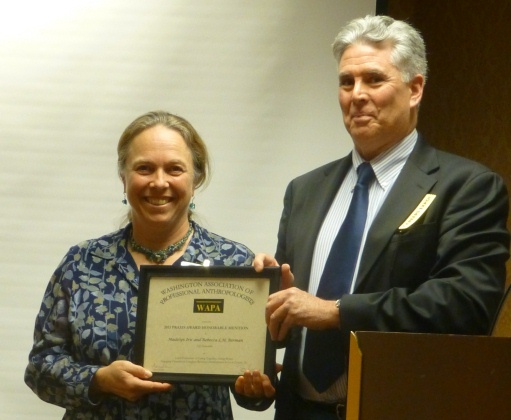 Photo: Department of Anthropology Chair Steve Nash accepts the Praxis Award Honorable Mention. In 2007, the Department of Anthropology at the Denver Museum of Nature & Science launched its ground-breaking Repatriation Initiative both to address the legacies of its own collections and to contribute to the complex debates surrounding the care and return of cultural items and human remains in museums. Using anthropological understandings of cultural property, the cultural power of human remains, collaborative methodologies, and reparative justice, over the last five years the department has made momentous contributions to one of the most difficult and polarizing issues facing modern museums. Interestingly, this was actually the only award whose team was working within “traditional” or typical anthropological contexts, in this case a museum’s archaeological collection. The team first restored the museum to federal NAGPRA compliance and mended relations with Native American stakeholders, and in the process exceeded government standards and raised institutional awareness of the importance of addressing stored human remains. The team concluded several successful repatriations of remains and also established a Native American Sciences Initiative, comprising five programs (a scholarship program, a career day, etc.). In addition, the project went beyond NAGPRA concerns to address the remains of September 11 victims and native artwork from Kenya. The department is represented for the award by Chip Colwell-Chanthaphonh and Stephen E. Nash. Dr. Colwell-Chanthaphonh is curator of anthropology at the Denver Museum of Nature & Science. Photo: Team members Victor Garcia, Rodney Terry and Laurie Schwede accept the Praxis Award Honorable Mention on behalf of all team members. This 2010 Census evaluation explored differences among race/ethnic groups in types and sources of coverage error and who is affected, to reduce differential undercounting, improve methods and suggest 2020 Census research. Using a controlled-comparison design, 17 ethnographers observed, audiotaped live interviews, conducted debriefings to identify and resolve coverage errors in the Census and a later survey in nine sites-American Indian, Alaska Native, Native Hawaiian, Asian, black, non-Hispanic white, Hispanic, Middle Eastern, and general sites, and wrote reports. A validation of observed households was done with final Census records to identify possible inconsistencies and coverage errors. The overall report includes recommendations. Every decade, concerns about the under-representation of certain populations in the US Census drive discussions about the use of statistical estimates versus direct counts for demographic completeness and accuracy. This application described how anthropological methods were systematically and relevantly applied to identify factors contributing to the under-representation of non-whites in national population estimates. Within the context of a large federal bureaucracy, the application shows a meaningful contribution to the potential accuracy of the Census, with enormous potential implications in the future. Anthropologists: Alexis Bunten (Alaska Natives), Ephrosine Daniggelis (Native Hawaiians), Rachel Donkersloot (Alaska Natives), Ted Fortier (American Indians), Victor Garcia (Hispanics), Sylvester Lahren (American Indians), Heather McMillen (Native Hawaiians), and Ruth Sando (generalized site). Other ethnographers: Robin Albee (non-Hispanic whites), Rae Blumberg (generalized site), Angel M. Foster (Middle Easterners), Eleanor Hubbard (non-Hispanic whites), Robin Jarrett (African Americans), Karyn Lacy (African Americans), Alison Newby (Hispanics), and Dawn Lee Tu (Asians: Chinese). WAPA would like to express deep appreciation for the work done by the 2013 award jurors to thoroughly examine the many applications received this cycle, and to thoughtfully provide comments and ratings for the award: H Russell Bernard from U Florida; Laura McNamara from Sandia Labs in New Mexico; and Stan Yoder, past WAPA president, from ICF Macro. 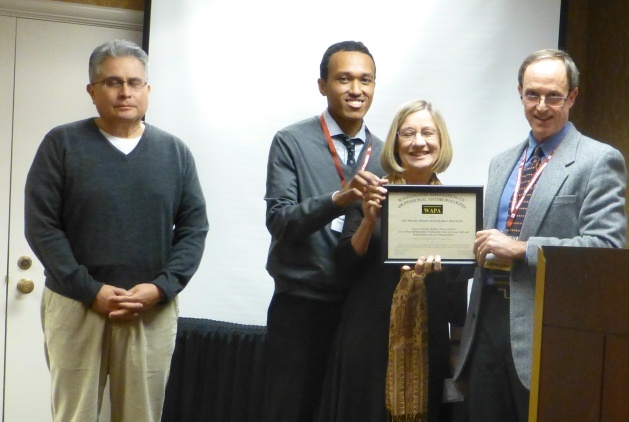 The Praxis Committee consists of Frances Norwood, James Stansbury, award founder Robert Wulff, and Terry Redding.